Ailsa’s Travel Theme this week is ‘Grey’. 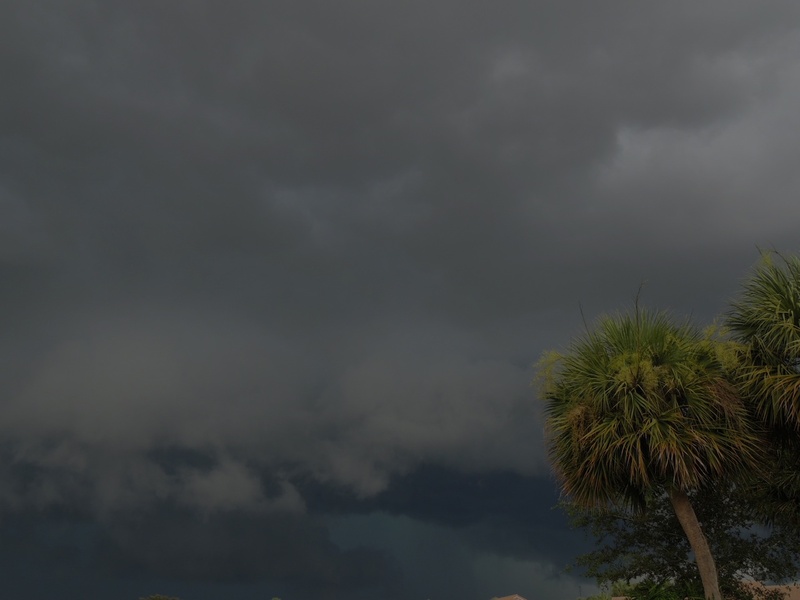 Early yesterday evening we were treated to dramatic dark grey skies here in sunny Florida. As usual, hubby had been working on the abandoned house renovations all day, and when he had got home and showered, we were planning to go out to Home Depot for yet more supplies. Luckily the storm didn’t last long and the skies soon started to clear. I must do an update on the the house progress. He’s doing a great job, but still so much more to do. If you have any grey photos to show us, do join Alisa’s Travel Theme this week. Wow, that does look ominous! It would have me battening down the hatches for sure! Ominous clouds! Got to love FL for its storms, they usually pass quickly, don’t they? It’s been so dry here. We finally got a full day of rain yesterday. Those clouds look quite menacing, Sylvia! Well ‘caught’. I don’t like dark skies, but that first photo is stunning. I have not seen such clouds in a long while, though. Hope the storm is already over Sylvia. Fantastic photos shot! I wish for a storm right now. These are cool captures with bushy palm tops. if we get dark skies like that is usually signals gale force winds! Oh, I hope those clouds stay away from here 🙂 Happy it was a passing storm, Sylvia! I would love to see an update on your house! The grey sky looks so scary! Very scary skies there…….we had some rain finally yesterday, but boy, we could use alot more! Oh my goodness the sky looked very threatening. 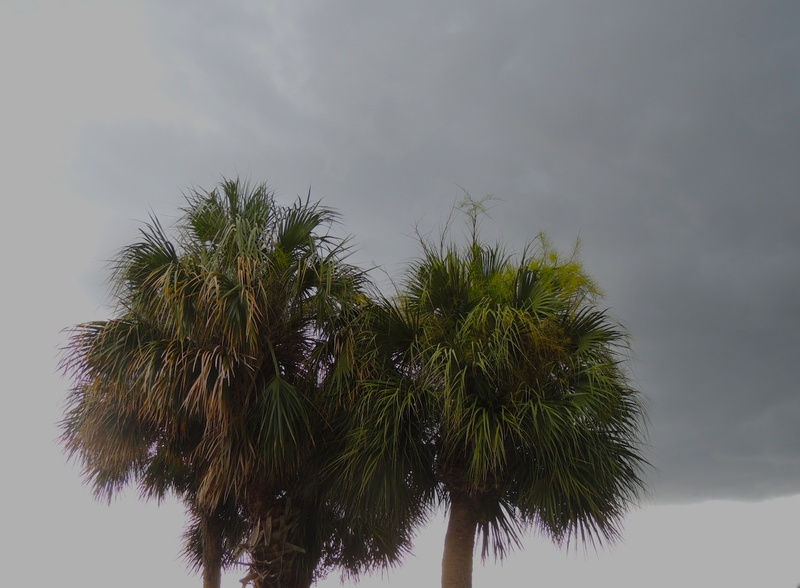 Do you get tropical storms this time of year? The oncoming thunder storms are ominous before they begin. Looks scary and very similar to what I am seeing out of my windows now. It was not a storm but the wind was quite strong. We had gray skies which unloaded barrels (okay inches) of rain. My son saw a rainbow on the day his first son was born yesterday! Yes, it really was a magical time for all. I appreciate this happy reply. Still hoping to see some of those gray skies here. What I remember from Florida was the nearly daily rain showers. Most of them short little deluges and then back to sun. We are about to launch a house project not unlike yours and I’m lucky not to have to move until it’s done, or at least close to done. Is a house project ever TRULY done? What incredible contrasts in the first photo. Was the storm as threatening as the sky made it seem? Sjoe… lyk dreigend. Het julle donderweer? I’d forgotten your house. I don’t remember you describing it as abandoned before, poor house, it will be your home soon! Oooo, that’s some storm sky there, Sylvia — sort of exciting but scary, all at once. Great storm capture, Sylvia. Hope you guys got some rain . . . it’s been concentrated around us for long enough. And, yes, please do an update on your house. It looks like storm is about to come!